Bonanza Satrangi is one of the brands of Bonanza Garments. Bonanza Garments is quite an old name as far as clothes are concerned. It was founded many years ago to provide branded and high quality clothes for women and men. There are shirts among the new arrivals released by Bonanza. These shirts have great prints and some of them have prints also. Plus, these shirts are really affordable as compared to similar items by other brands.Bonanza Satrangi prêt 2014 new arrivals for women are now available. They are the latest additions to the Satrangi collection of Bonanza 2014. 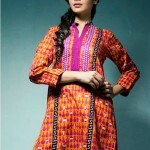 The clothes among the new arrivals are pretty awesome and are great for different women of different ages.